If touchscreens are the present, then perhaps touch-free screens are the future. Samsung revealed via the MIT Technology Review over the weekend its ambitions to bring mind-controlled tablets to market, with an eye toward disabled people who may experience difficulties using current technologies. Samsung is reportedly working with researchers at the University of Texas to develop devices that interpret users' brainwaves through EEG caps. The tech is currently in an early but functional state, with accuracy around 80 to 95 percent when selections are made at intervals of at least five seconds. Forget invisibility cloaks - mind-controlled devices could be the next big wave of innovation. Mind control is nothing new, but so far it's been used mainly for toys and hyper-niche products like brainwave-reading wheelchairs for disabled consumers. But as TechRadar noted over one year ago, mind control is about to go to the next level - and it looks like Samsung is going to take it there. 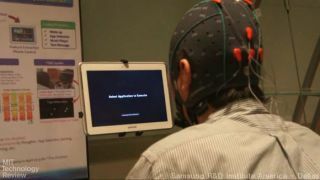 Samsung and the University's researchers have developed an interface that allows users to launch applications on a Galaxy Note 10.1 by focusing on them while wearing an admittedly clunky EEG cap. Eventually the tech will be able select contacts and songs, turn devices on and off, and more. "Several years ago, a small keypad was the only input modality to control the phone, but nowadays the user can use voice, touch, gesture, and eye movement to control and interact with mobile devices," Samsung's lead researcher on the project, Insoo Kim, told the MIT Technology Review. "Adding more input modalities will provide us with more convenient and richer ways of interacting with mobile devices." The researchers are working on ways to make the EEG caps easier to set up, more efficient at reading brainwaves, and less conspicuous to wear.